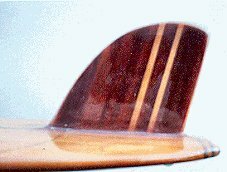 1963 Wally Carle Chambered Balsa Malibu 9 ft 8"
Chambered balsa blanks with 1" redwood stringer and tailblock. Fibreglassed. Redwood with 2 balsa strips and glass bead. Previous ding repairs filled with dark Plasti-Bond, these were removed and all repairs completed with Volan glass. 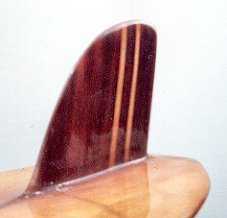 Board glossed and repairs sprayed by Jackson Surfboards, 1995. The decision to spray has subsequently been regretted. This board was made by the same manufacturer and almost a copy of my second surfboard, see # 2. 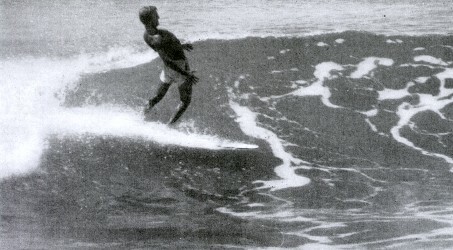 Longtime Cronulla surfer, Dave attended and confirmed the board was chambered and built by Wally Carle. Wally also worked for Norm Casey Surfboards, Rockdale. Surfabout Volume 1 Number 1 August 1962 page 32. Geoff Cater (2000 - 2016) : Wally Carle Balsa Malibu, 9ft 8'', 1963.